The Bosnian War was an armed conflict that took place between 1992 and 1995 in Bosnia and Herzegovina. The main actors were Bosnian and Herzegovinian forces, the Bosnian Serbs, and Bosnian Croats, the Republika Srpska, and the Herzeg-Bosnia. The war came as part of the dissolution of Yugoslavia. After Slovenia and Croatia seceded from the Socialist Federal Republic of Yugoslavia in 1991, the multicultural Socialist Republic of Bosnia and Herzegovina passed a referendum for independence as well in 1992. Bosnia, at the time, was comprised of 44 percent Muslim Bosniaks, 32.5 percent Orthodox Serbs, and 17 percent Catholic Croats. The Bosnian Orthodox Serbs rejected the referendum. The Bosnian Serbs, led by Radovan Karadzic and supported by the Serbian Government and the Yugoslav People’s Army, gathered forces to secure ethnic Serb territory called the Republika Srpska. The Bosnian War was marked by widespread violence, the destruction of towns and cities, and ethnic cleansings committed predominantly by the Serbs. The Siege of Sarajevo, the capital of Bosnia and Herzegovina was the longest siege of a capital city in the history of modern warfare, lasting from April 5, 1992, until February 29, 1996. The city was first attacked by the Yugoslav People’s Army, and then by the Bosnian Serb Army of Republika Srpska. Nearly 14,000 people were killed during the siege. Despite the Serbs early victories, they eventually lost momentum as the Bosniaks and Croats allied against the Republika Srpska after the Washington Agreement, which established a ceasefire between the Republic of Bosnia and Herzegovina and the unrecognized Croatian Republic of Herzeg-Bosnia. After Pakistan defied the United Nations embargo on arms to the region by supplying missiles to the Bosnian Muslims, NATO intervened. By 2008, the International Criminal Tribunal for the former Yugoslavia convicted 45 Serbs, 12 Croats, and 4 Bosniaks of war crimes. Recent estimates say that around 100,000 people were killed in the war and 2.2 million were displaced. An estimated 12,000-20,000 women were raped, mostly Bosniak women. Bosnian soldiers smoke and take a break on the front line next to a sign that says, “Welcome to Sarajevo” in Sarajevo, Bosnia, in the fall of 1994. Trench warfare took place all around the city. A Bosnian woman visits her husband’s grave in a cemetery in Bihac, Bosnia, that is filled with people who were killed during the Bosnian war. 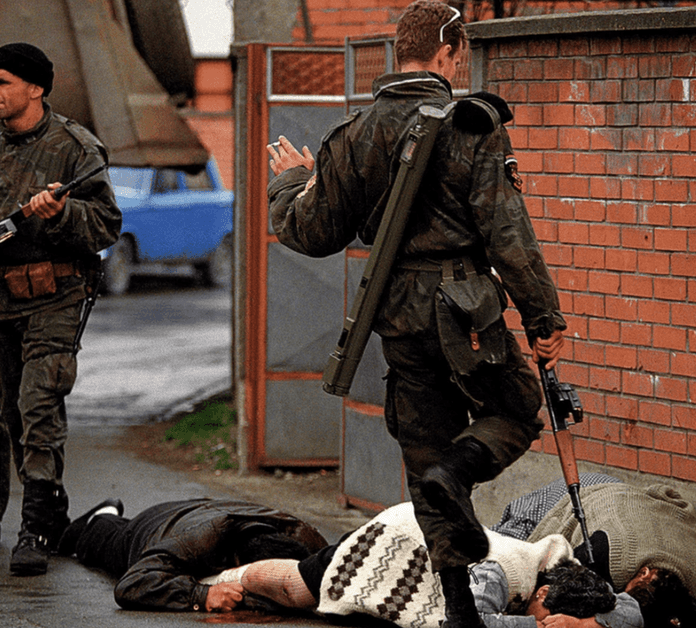 Arkan’s Tigers, the Serb paramilitary volunteers kill Bosnian Muslim civilians during the first battle for Bosnia in Bijeljina, Bosnia, March 31, 1992. The Serbian paramilitary unit was responsible for killing thousands of people during the Bosnian war, and Arkan was later indicted for war crimes. This image and many of the following pictures eres used for evidence in the International War Crimes Tribunal for the indictment and conviction of Serbian leaders. A Serb man attempts to put out a fire that was caused by Serb arsonists in the Sarajevo suburb Grbavica, Bosnia, 1996. The arsonists were trying to force the man to leave the city rather than let him stay under the Muslim-led Bosnian government. A Muslim in Bijelina, Bosnia begs for his life after capture by Arkan’s Tigers in the spring of 1992.